If your handicap is 25, you fall into the category of a high-handicap golfer. The golf industry makes excellent clubs that are specifically designed for your ability level. Lightweight drivers with large heads are ideal for many high-handicap golfers. So are super-game-improvement or max-game-improvement irons, and all the leading golf companies manufacture models for both women and men. These clubs enable you to maximize your distance and accuracy and boost your chances of lowering your handicap. If you have a handicap of 25, you probably swing relatively slowly, so you want a shaft with enough flexibility to whip through the ball at impact for maximum distance. A ladies shaft has the maximum amount of bend, but don't be fooled by the name. Such shafts are appropriate for anyone with slow swing speeds, male or female. If you generate more club head speed, the best shafts for you might be less-whippy senior shafts or regular shafts. A launch monitor at a pro shop or golf shop can measure your club head speed. In terms of the best club to hit off the tee, a 25-handicap female golfer has two good options. You might want to tee off with a 3-wood instead of a driver. The shorter 3-wood is easier to control than a driver and you are more likely to end up in the fairway instead of the rough. Since a 3-wood has more loft than a driver, it's easier to launch shots into the air as well. However, if you hit the driver relatively straight, it might be the best choice, since it gives you a bit more distance than a 3-wood. When you have long shots from the fairway, a 7-wood or 9-wood make it easier to get the ball off the ground and into the air. Super-game-improvement irons and hybrids — clubs that represent a cross between an iron and a fairway wood — are ideally suited to a female 25-handicap golfer. These clubs give you maximum performance on your mishits. Super-game-improvement irons have larger club faces with more weight distributed around the perimeter, so you get more distance and accuracy when you fail to strike the ball in the center of the club face. The soles of these irons are wider, which helps prevent you from digging too deeply into the turf. Hybrids are much easier for most golfers to hit than long irons and mid-irons, so a set of clubs with hybrids and short irons and wedges is your best bet. The right putter and wedges can also help you reduce your score. 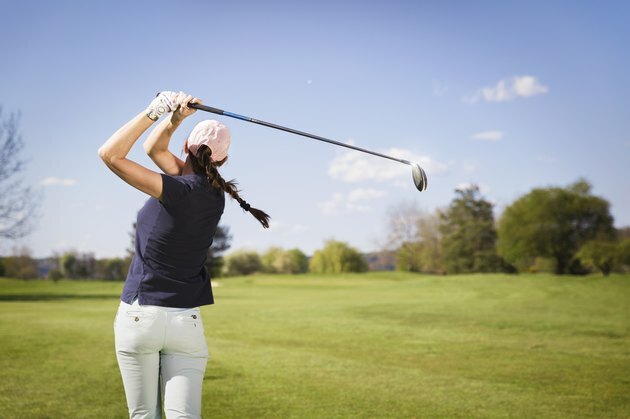 Although professional golfers may carry three or four wedges, a 25-handicapper is best off with a pitching wedge and a sand wedge. A pitching wedge is included in most sets of irons. A sand wedge usually must be bought separately. When shopping for a sand wedge and a putter, feel is extremely important. So test a number of sand wedges and putters to find the ones that perform best for you. The best clubs for a woman with a 25-handicap — or any other golfer — will be custom fit to your swing. Although club fitting used to be reserved for the pros and elite amateurs, its essential for any golfer looking to play her best. As equipment expert Tom Wishon explains, high-handicap golfers need the most help and thus stand to benefit the most from a club fitting. What's the Difference Between a Senior Flex & a Regular Flex Golf Shaft?